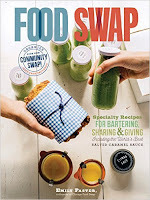 We are excited to announce the second Chicago Food Swap will be taking place on March 17 at 3 pm. Pretty Little Things has graciously offered to host us again, for which we are very grateful. Pretty Little Things, a charming alternative craft boutique, is located in the heart of downtown Forest Park at 7324 Madison Street. Forest Park is easily accessible from 290 (take the Harlem exit) or by the Blue Line of the El. Madison Street is home to numerous boutiques, antique stores and restaurants, which make it an appealing destination for locals and tourists. So, if you are coming from another part of the Chicago area, plan to come early and shop or stay after the swap for a nice dinner. Just to remind you, the Chicago Food Swap is an opportunity for home cooks, bakers and gardeners to trade their homemade and homegrown items. No commercial sellers are permitted and no money exchanges hands. But you don't need to be a gourmet cook to participate! As long as you can make one yummy thing to trade -- a batch of cookies, a spice mix or a drink syrup -- you are more than welcome. Some examples of popular swap items include baked goods; jams, pickles or other canned goods; granola and spice mixes; homemade pasta; and even drink syrups. The idea is to show off a bit, bring home some yummy treats and to meet fellow cooks. Feel free to bring samples for tasting or just to share! It is free to participate in the swap. But, to help us plan, we do ask that people register in advance. You can register here. For more information and to chat with other swappers, be sure to check out our Facebook page.